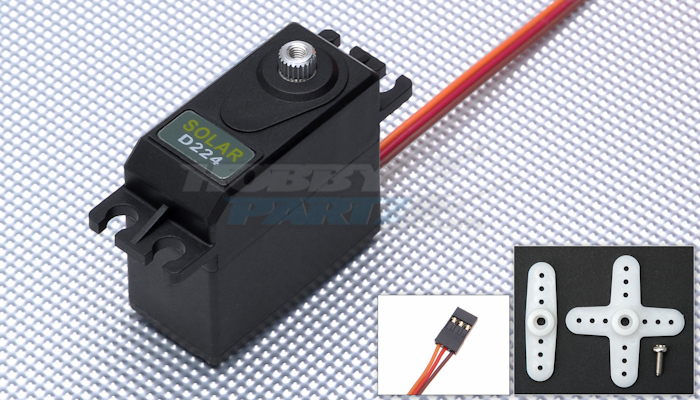 Solar Servos - yep, that's the brand name. Anyone have any luck with these, I think they're new to the market but they look promising and have great prices for digital and metal gear servos. I don't see a servo programmer listed so I hope they'll be able to be programmed with something. Saw these today at NP's website. Not sure but they do have some good prices on metal gear and digital servos. Would like to know more about them. Lets hope someone has used them and will share! I hope they have a programmer available. From what I understand there's no generic servo programmer, the Hitec programmer will only program Hitec servos etc. They appear to be of the exact same specs as the EXI servos. I have some EXI servos that I'm putting in some things but I don't have a review available yet. Bicycle monkey, what is the purpose of a servo programmer? I've heard of these but never ran into a need for one. If your are looking for metal digital servos, I would recommend the T-pro servos. I have the MG90s's in my blade 400 and I love them. The price is right there with hobbyking but you can get them in days instead of weeks. I haven't tried their larger ones yet but after my experiences with the smaller ones and the reviews I've heard I wouldn't hesitate to try them. Digital servos can be programmed either with a stand alone programmer or through a USB port on a PC. You can reverse them, change end-points, movement speed, etc. The problem is that you can only program servos with their brand programmer...ie, the Hitec programmer will only program Hitec servos etc. Oh. I can do most of that with my radio. Are programmers for when your radio can't do that? You are correct, servos can be reversed with your radio, but if you have two elevator servos with a Y-cable plugged into your RX, even if you reverse the servo on your radio, one will still go the wrong direction. In that example, if using analog servos you would either not use the Y-cable and plug the other elevator servo into a separate channel and use the appropriate mixing on your radio to get it to work, then fine tune it make sure they move at the same rate and have the same amount of throw. Or you could open up the servo and do the appropriate soldering to physically reverse the servo. Or an in-line servo reverser which actually has some latency and is a point of failure. Using a digital servo programmer (if available) this is all done in a fraction of the time and make sure the endpoints are exact on both servos and that one is reversed...no extra radio programming needed. I think the main advantage with digital servos is that especially when two servos come together to control the exact same surface. As bicyclemoney said the reverse can´t be done using the y-cable over your transmitter. So you are pretty much forced to open up the servo and reverse it manually. But that isn´t even the main problem. The biggest one is that if one of the control horns are not on the equivalent spot the servo will do roughly the same way and therefore move the surface the same way, but because on control horn is possibly slightly off the other, even if it is just a millimeter, the servos will be working against each other! especially with non-metalgear servos that is taking off same life time of those servos. I see. I have always done it by mounting the servo in the right direction to get the throw I need and adjust the linkage so that they don't buzz. I know what you mean though. Once I got the DX8 I just do it in the programming. That's actually the reason I got the 8 so that I had enough channels to run each servo on a separate channel. It would be nice to have the programmer and set up some dual aileron servos without using all my channels though. I've been wondering about programmers for a while. Thanks for enlightening me. Yeah but not everyone has a DX8 or something similar. Even if you do. Imagine you have 2 servos for elevator, 4 servos for aileron (to per side) then 2 for flaps and landing gear and steerable nosewheel. on most other RC systems it's just labeled ch1 ch2 ch3 etc. and you can program any switch or knob you want to be ch. 1 or ch.2 etc. I suppose, if that's a shortcoming I'm not really seeing it. I can change switches around enough to suit me. I typically use the flight mode switch to do everything I need to and just program everything to it anyway. I don't use the individual rate switches. I have the option to use the knob if I want but haven't found a need. Personal preference I guess. So far it's working well for me. I think if I ever need more channels though a Super 8 futaba will probably handle it.